We are pleased to announce the DACH, Zurich Chapter 2011 elections! We have 1 candidate for Chapter Chair, Renee Rousseau-Osterwalder, and 1 candidate for Chapter Secretary/Treasury, Ashley Wheeler. 1. Please read through the candidate statements enclosed in this email. 2. To vote, come to any DACH event on or before Friday, 21 October 2011 to fill out a ballot. If you cannot attend a DACH event before then, please contact zurich@democrats.ch to arrange a way to vote and fill out a ballot. **Note: Only DACH members based in the German-speaking region can vote in this chapter election. On a personal note, I moved to Zurich in 2007 and immediately became involved in Democrats Abroad. I soon found myself overseeing the organization of meetings, special events, and voter registration activities in the Zurich area. During the historic ’08 elections the group grew in size and energy and by 2009 we were able to successfully become the first DACH Chapter! Since then I have continued to lead the group and encourage other members to get more involved in group activities and leadership functions. Indeed, while the last 4 years have brought me joy, memories, and a sense of pride in what we have managed to do as a collective, it has and continues to be my belief that the success of our chapter depends on the energy and investment that our community puts into it. With that, I’m proud to say that our 1st Chapter election is both a realization of that effort as well as a wonderful demonstration of the commitment, energy and investment within our amazing membership. Though I will not run for a position, I will continue to be involved in the political space by participating in activities, supporting our new leadership, and doing what I can for a successful 2012 US election! Thank you, DACH members, for everything and here’s to our continued success! Hello Fellow Democrat Abroad in Switzerland! My name is Renee Rousseau-Osterwalder and I am running for the position of Chair for Democrats Abroad Zurich. I was previously co-Chair for Switzerland for Obama together with Rene Malle; and am currently the PR person for Democrats Abroad Switzerland, German Region. Switzerland for Obama worked closely with DA Switzerland Zurich and folded into DA Switzerland after the primaries with tremendous success! I attended then Senator Obama's rally in Berlin with Swiss national television SFDRS and the daily newspaper Blick. I was able to attend President and First Lady Obama's visit to Strassbourg France. I have participated in a "Door Knocking" event with Democrats Abroad in Washington DC in April of 2009 and it opened my eyes to how our political system works and to the fact that connections matter. I was also fortunate enough to spend some quality one on one time with David Plouffe and Ex DNC Chairman, Gov. Tim Kaine. I would love to continue the fantastic work started by Jennifer Giroux and hopefully I can bring some new ideas which will expand our base and support for the President not only among Democrats, but Republicans and Independent voters as well. Although I am a steadfast Democrat; I feel that we should respectfully hear out our fellow Americans from the other side of the aisle, for the good of our party and the nation. We will probably never agree on everything, but at the least, we will know where we each stand. It is my opinion we can achieve more together than divided. This President has so much more to do and give to our country and I for one want to be a part of helping him continue the changes he has fought so hard to enact. As the old saying goes "A house divided against itself cannot stand!" I do not know if I am the best person for this job, but I promise, I will give my all to represent our region and party to the best of my ability. My fluency in Swiss and High German are an advantage when communicating our party's vision and platform with the Swiss media and Swiss citizens alike. I look forward to working with all of you! I know at times we have been disheartened, but we have come too far to give up now! Let's stand strong together and continue on with the mantra which brought us victory in 2008... FIRED UP! READY TO GO! 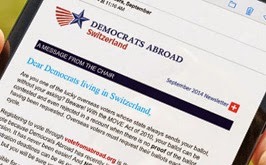 Hello fellow members of Democrats Abroad Switzerland! My name is Ashley Wheeler and I’m running for the position of secretary/treasurer for the Zurich chapter of Democrats Abroad. Though I am not a longtime member of Democrats Abroad Switzerland, (I joined when I came to Switzerland about a year ago) I have been very active with Democrats Abroad since my arrival. I am the current secretary for Democrats Abroad Switzerland and have met many wonderful people who have motivated me to become more involved. Prior to my arrival in Switzerland, I lived in Wichita, Kansas and was active in democratic politics there. I was the president of my university’s College Democrats group and was the vice-president of another local group, the Fourth District Young Democrats. I was the Director of Communications for a candidate running for Kansas State House of Representatives as well and gained much experience in talking to voters and motivating young people to get more involved in local government. As the future secretary/treasurer of the Zurich chapter, I hope to bring a fresh perspective to the chapter, as well as encourage others to get excited about the upcoming election in 2012, excited enough to motivate others to vote from abroad. I look forward to working with all of you in the future and hope to meet you in person very soon!